It’s our Gum Tree Wish List Gift Guide! 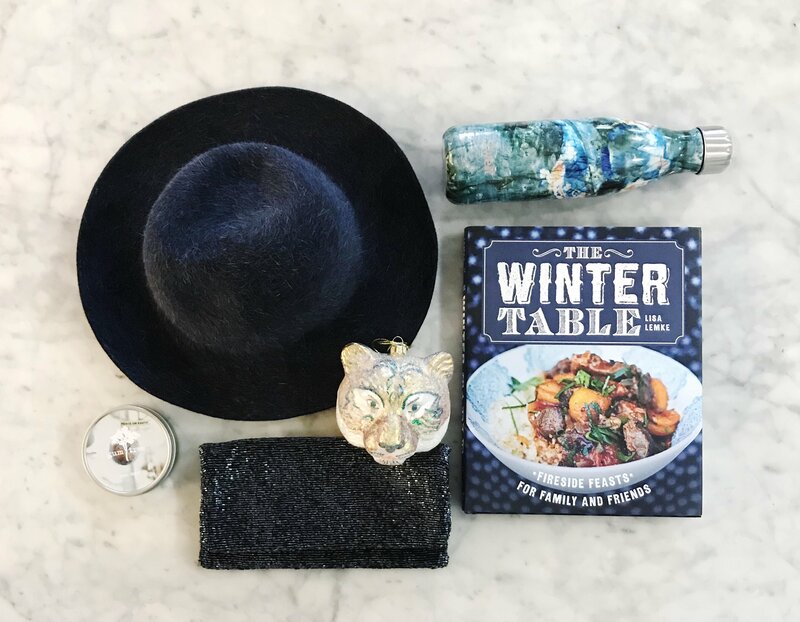 In addition to world peace, I’d like this Hat Attack crushable felt hat $184, a new S’well bottle $35, The Winter Table cookbook for Christmas Dinner inspiration $24.95, Beaded Clutch $96, Brand New Gum Tree Holiday Travel Candle to burn on our upcoming Airstream camping trip $14, and that fabulous sparkly Tiger Head Ornament $15. 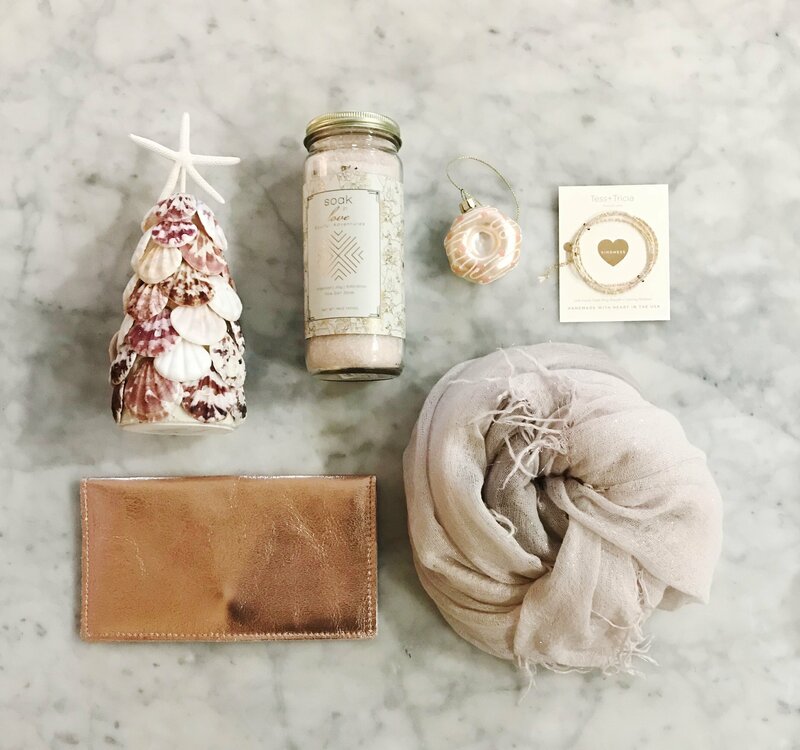 Pink Clam Shell tree from our favorite Nate Ricketts $64, Soak in Love bath salts $34, Frosted Doughnut ornament $13, Kindness wrap bracelet (for the kindest woman I know) $46, Chan Luu cashmere silk and metallic scarf $212, Tracey Tanner rose gold wallet $159. 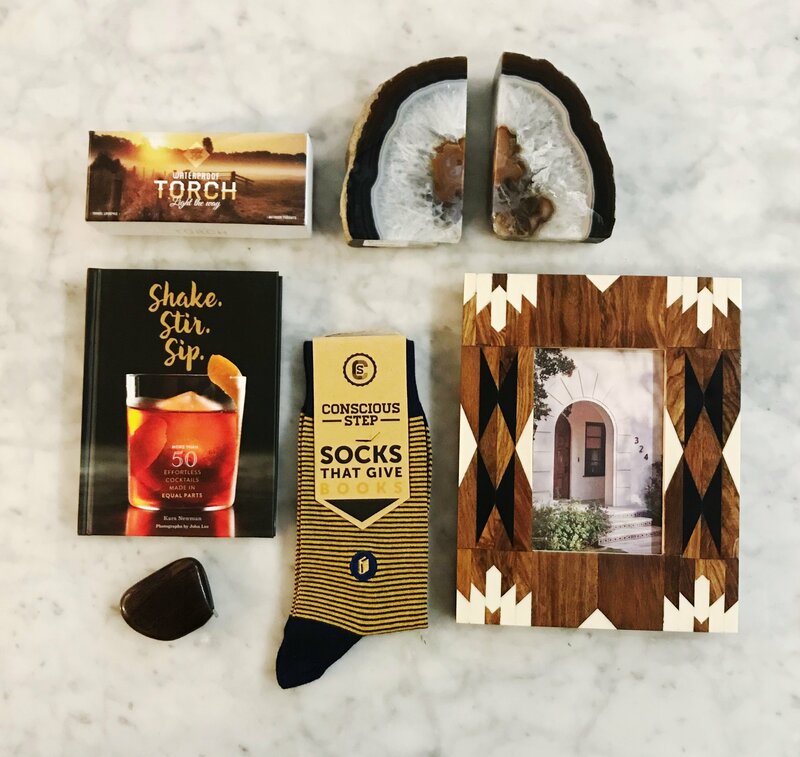 A waterproof Torch for his next fabulous travel adventure $23, Agate Bookends $59, Navajo Picture Frame $55, Socks that give back $16, Pebble tape measure $18, Shake. Stir. Sip. for cocktail party recipe inspo $16.95. 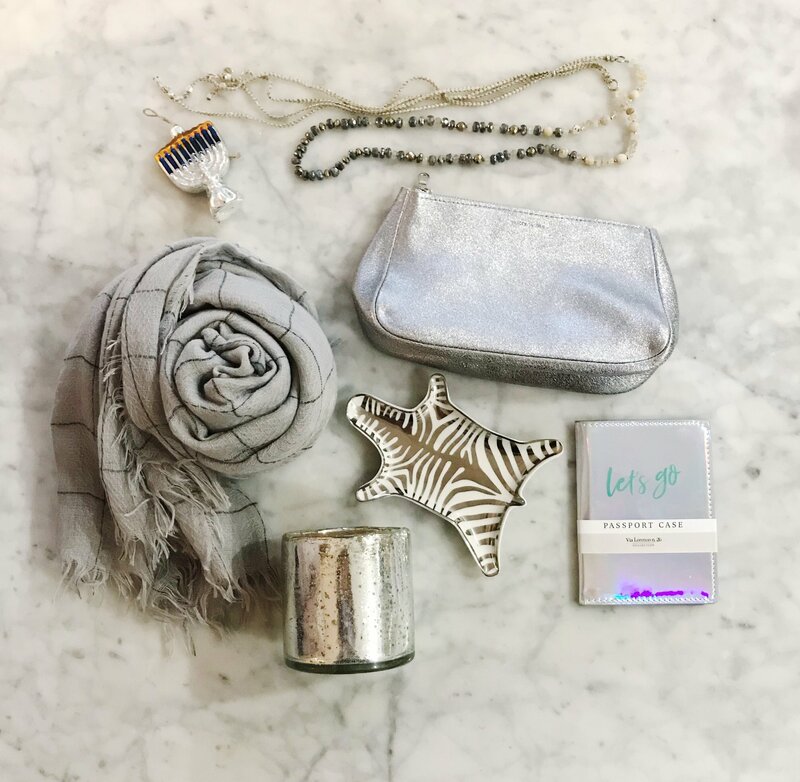 Pretty little menorah ornament $16, Chan Luu Pyrite mix tassel necklace to add to her fabulous jewelry collection $271, Tracey Tanner leather pouch $99, Let’s Go passport holder $12, Jonathan Adler zebra tray $32, Ginger Patchouli scented candle $34, and a cozy super soft scarf $32. 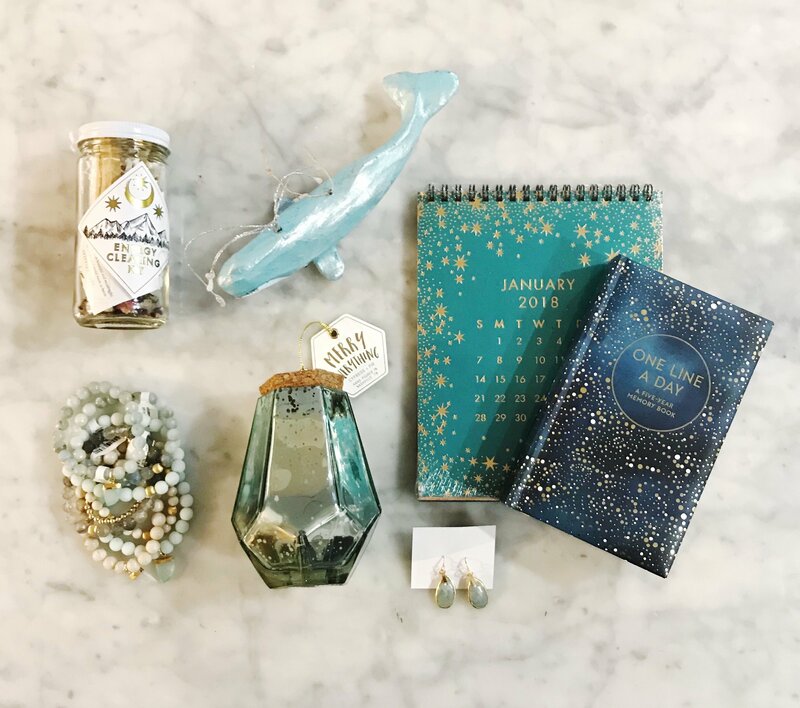 Energy Cleansing Kit to start off the new year right $22, that gorgeous shiny whale ornament $20, Letterpress desk calendar $26, One Line a Day journal $16.95, Lulu Designs Aquamarine earrings $164, Mercury Glass candle $21, and an armful of Ten Things Jewelry bracelets $44-92. Feather Patches to pretty up her army green jacket $8, Oh My Ombre mechanical pencils $10, Do Overs erasable highlighters (how cool) $12, Unicorn/Rainbow travel pillow $35, Mini Boo’s collectible characters (because we only have 20 of these tiny plastic animals already, what’s one more?) 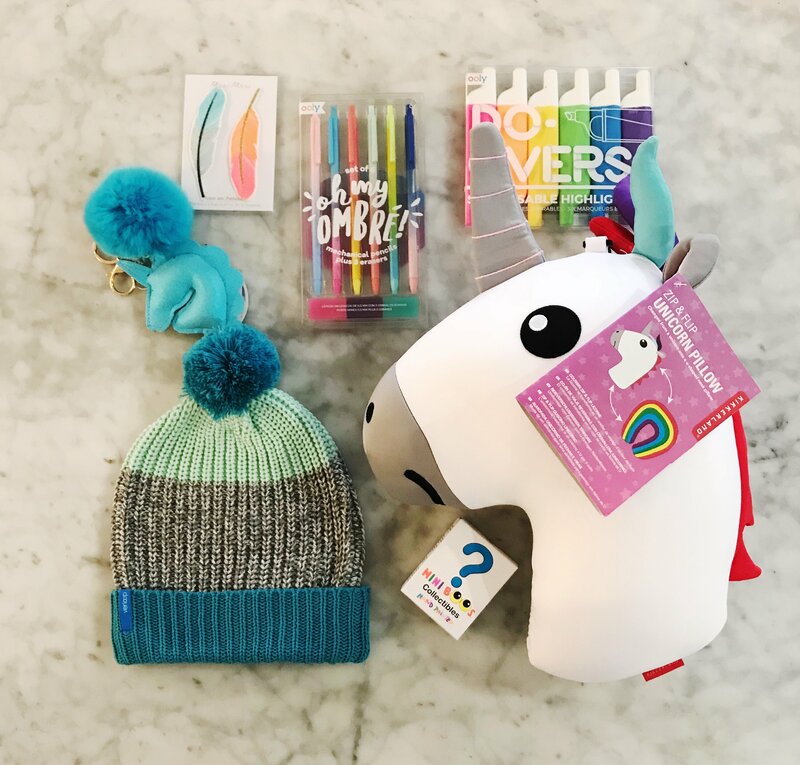 $5, Cozy pom pom hat $17, and a furry unicorn keychain for her backpack $15. 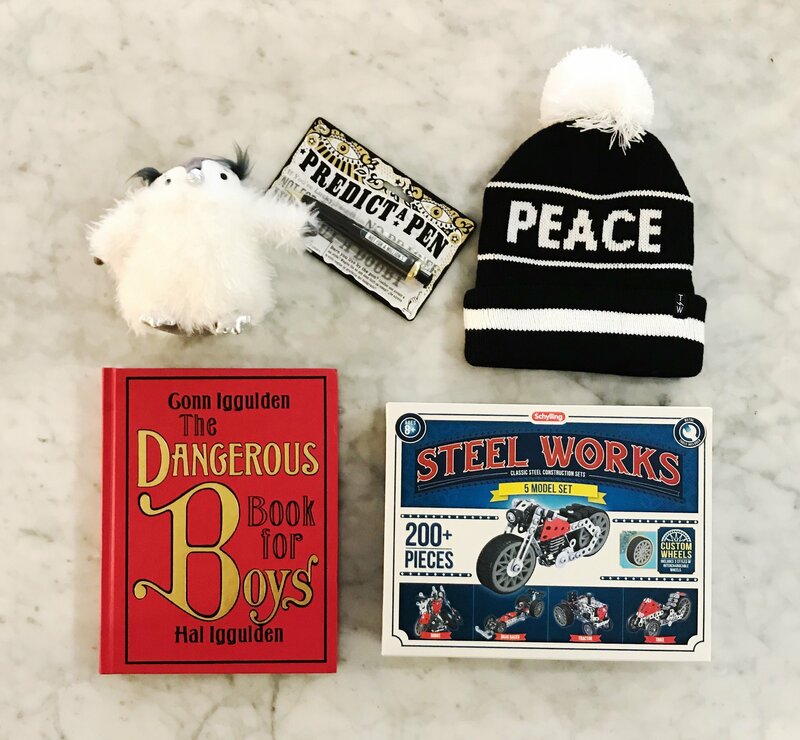 Jellycat fluffy baby Penguin $18, Predict a Pen (hours of fun, especially on car rides and to drive his sister nuts) $7, Peace Y’all Beanie $28, Steel Works Classic construction set (this might really be for big Will) $20, and the Dangerous book for Boys $16.99. Come on in and make your wish list now at any of our three shops, and be sure to get what you’re wishing for this Holiday Season.